You maybe thinking that how can a person be curious about things around them?. The Answer is "You are born Curious". 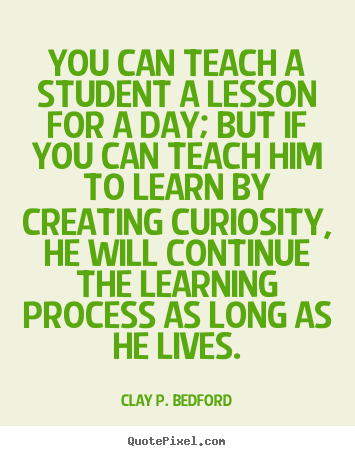 Curiosity is that skill which is present in every individual. Recently, I heard a quote saying that "If you can light a spark of curiosity in a child, they will learn without further assistance". This is because children are natural learners and so are we. Curiosity doesn't need anything for its existence. Curiosity has its own reason for existence. If we pick a very basic example of Thomas Edison, then you will know that Thomas Edison tried almost 2000 different materials in search of a filament for the light bulb. When all the materials didn't worked as per his expectations, then his assistant complained, "All our work is in vain. We have learned nothing." to that Edison replied very confidently, "Oh, we have come a long way and we have learned a lot. We know that there are Two Thousand elements which we cannot use to make a good light bulb." Thomas Edison was determined and curious about what he was doing. He didn't stopped even when failing so many times, which most of us would give up. That's the Power of Curiosity. He was keen to know how it works (i.e. He was curious to know that how water can be transformed into water droplets and later on form clouds). He actually tested whether what he heard just now was right or wrong. Many researchers and scientists, invented new technology not only because they have knowledge but they were curious to know about things and they were not afraid to fail at times. If you remember, when we were young and we don't know how to walk, at that time we had fall many times while walking, still we had tried our best to walk without any assistance and we did succeed. Some started walking early while some started a bit late. It is not about when you started, it's about whether you had given your best shot or not. If Biologist were not curious enough to know about How the Human Body Works then doctors were not able to save lives of people which they are doing now with such an ease. So, try to be curious and explore the various things around yourself. If I'm able to spark curiosity in you by this post, then I will be happy because making someone curious is like contributing to the whole mankind.